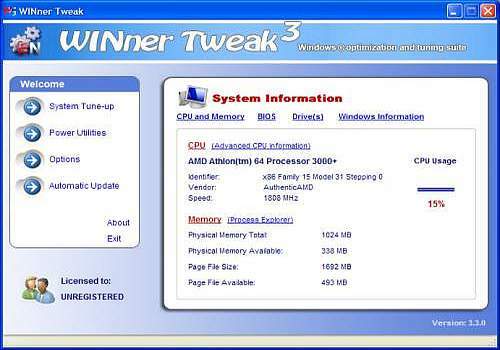 WINner Tweak is a tools suite for tweaking, optimizing and tuning of Windows XP/2003/2000. It helps you increase performance and manage your system using various tweaks and utilities for settings including Windows, Hardware, Security, Network and Software. In addition to the tweaks, the program also offers several additional tools (Power Utilities) that include a Disk Cleaner, Registry Cleaner, Shortcut Cleaner, Uninstall manager, File Shredder, Start-up Manager, Popup Blocker, Password Generator, Internet Cache Analyzer, Process Explorer,Translucenter, Access Limiter and a Folder Protector to prevent access to selected folders. The import and export feature enables to create an export file, that contains specifically selected settings and tweaks.This export file can later be imported into WINner Tweak on the same computer, or to another computer with WINner Tweak.